Meghan Cowens is one of the lucky ones – her work is her passion, and it changed her world. Meghan’s goal – provide her patients with the tools to live their best lives – emotionally, mentally, and physically. Meghan is a licensed acupuncturist, Tuina integrative therapist, and yoga educator. Meghan firmly believes that “healing is a gift you give yourself,’’ and that belief informs her entire practice. maximize flexibility and strength in her patients’ bodies. Meghan is a Yin Yoga instructor, and she incorporates Yin Yoga concepts into her practice to provide additional benefits to her patients. Yin Yoga is based on Chinese medicine meridian pathways and their relationship to the deep fascial pathways in the body. Meghan uses traditional Yin Yoga techniques to help her patients strengthen and stretch their deep connective tissues and regulate their energy flow for long-term health benefits. 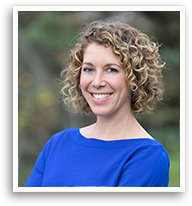 Meghan is a practitioner of Acupuncture, Manual Therapy, Laser Therapy and Traditional Chinese Medicine, licensed by the state of Maine. Meghan earned her Master’s Degree at Atlantic Institute of Oriental Medicine in Ft. Lauderdale, FL in 2006. Meghan practiced in Delray Beach and Ft. Lauderdale, FL, before joining Heritage Integrative Healthcare in April 2017. Meghan has been practicing yoga and meditation for more than 20 years. When Meghan isn’t working, she loves spending time in the outdoors with her daughter, baking, reading, and laughing.